Antonio Giacinto Castiglione first appears in the Painesville, Ohio, area between 1905 and 1914. His common name in the United States was Tony Castiglione. Antonio Giacinto Castiglione, was born on January 5, 1883, at Licata, Sicily. Antonio died on September 15, 1937, at St. Luke’s Hospital, Cleveland, Cuyahoga County, Ohio, at age 54, of liver cancer. Antonio’s remains were return to Sicily for burial. Antonio Giacinto Castiglione immigrated to the United States on February 24, 1905, at age 22. He became a citizen of the United States on July 8, 1914. Antonio resided at State Street, Painesville, Lake County, Ohio, when he was naturalized. 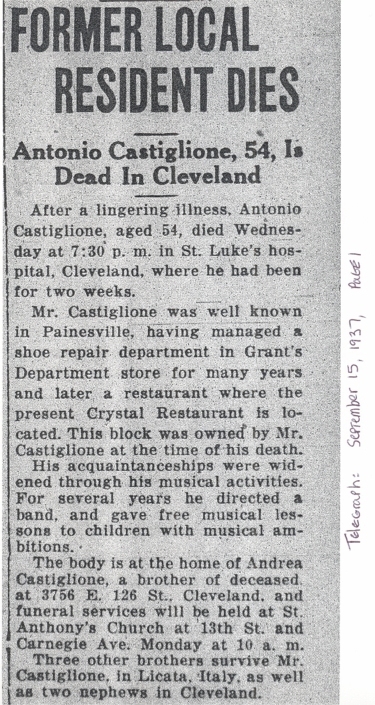 Mr. Castiglione managed the shoe repair department in Grant’s Department Store for many years and later owned a restaurant on North State Street. At the time of death, Antonio resided at 3756 East 126th Street, Cleveland, Cuyahoga County, Ohio.